Recently, I was invited to attend a plausible event; progressive and ultra in its nethermost core. I wonder why ‘Whisper’ is named whisper. Unquestionable, since we never say menstruation out loud. Do we? But most ultraist bloggers were called to be a part of something revolutionary. Get a glimpse of the affair on my twitter & instagram. And here’s an episode for the readers. 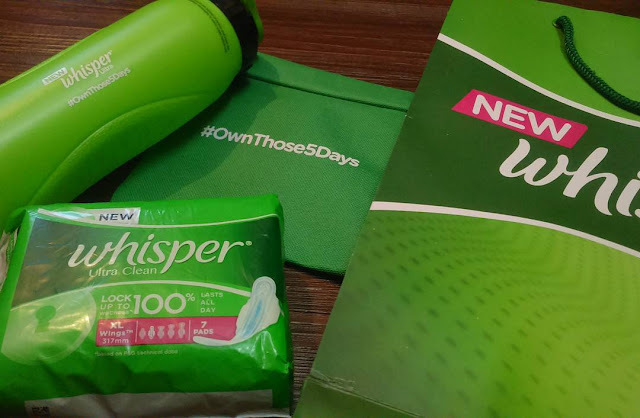 The event had two aims to consider, launching the new Whisper Ultra Clean and breaking the taboos and traditions associated with menstruation. The event was held around 11.15 am at St. Regis in Lower Parel. There was transparency of the guests so there was no surprise there. The Guest panel had the well known Bollywood Actress- Kalki Koechlin, Stand-up comedian and writer- Aditi Mittal, Gynaecologist- Nandita Palshetkar and Whisper R&D expert- Chetan Kotyalkar. The event began around 12.30 with Aditi Mittal making an appearance on stage with her energetic joyfulness. Her account of Menstruation euphemisms, Period rescue incidents, Airport episodes of women bonding in need of sanitary napkins had everyone rolling in the aisles. After a wave of comic drama, the audience was stroked with mocking remarks of how periods are generally looked upon in India. After ebb of applause, Kalki Koechlin made her appearance on stage. 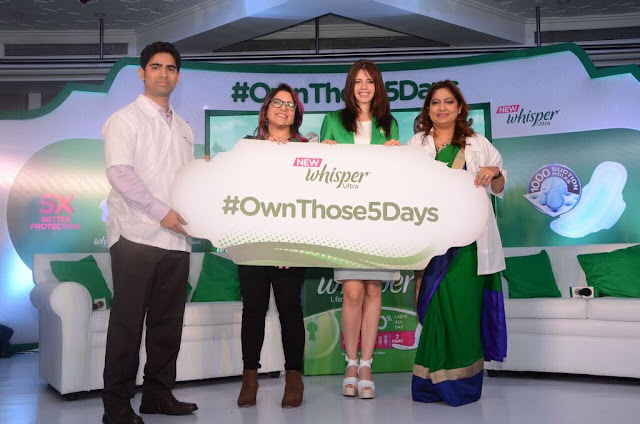 Aditi Mittal & Kalki Koechlin also made aware of the previous campaigns Whisper served with an aim of blasting the myths and Period taboos. Women, even today practice a handful of irrelevant practices like avoiding white, refraining from shampooing during periods, staying indoors during the periods and most important, not exercising during periods. Later with other Whisper Campaigns like #Touchthepickle. The Period conversation was succeeded with Aditi & Kalki sharing their personal experiences and opinions. The conversation concluded with an undisputed idea of needing a superior Sanitary Napkin for the lifestyle in contemporary age. Nandita Palshetkar advocated working out or exercising during periods and providing us bloggers with some tips to overcome the cramps. 2) To follow a wholesome & healthy diet. 3) To hydrate well and exercise. She further explained Caffeine aggravates the cramps during periods. She maintained a statement throughout to check with your gynaecologist if periods are late or missed for more than 40 days. The Whisper R&D Expert highlighted the unique features of the New Whisper Ultra Clean. This revolutionary Sanitary Napkin has over 1000 suction holes and three different layers to stop leakage and contains some whimsical magic gel crystals that transform liquid into gel. The distinct feature about the New Whisper is it has light floral fragrance which controls odour. During the tryout session, Mr Kotyalkar gave us a demonstration on how this research was what exactly a woman needs during those 5 days. The conversation concluded into pledging in spirit of being Unstoppable even during those 5 days with #OwnThose5Days. Aditi & Kalki started the challenge and everybody took their chance to overcome their hurdles during their periods. On personal note, I would like to Thanks Whisper for making me a part of revolution that is changing the frame of mind of not just us women bloggers rather every other woman in India.